There are nearly 50,000 incidence of deaths per year in Hong Kong. With the increasing and aging population in the territories, mortuary facilities and services are in growing demand. This indispensable service should be provided with sufficient resources to make its operation and service meeting expectations of the general public, as it serves as the last gatekeeper in the life journey. In general, the deceased are kept in hospitals or public mortuaries until funerals. Some of the existing public mortuaries, built years ago, have been operated in outdated workflow designs. There were incidents of body missing and misplacement, caused by the staff who had not followed the working guidelines. Such shocking events have aroused fear among the community towards the standard of mortuary services. The public concern has led immediate remedies being taken to enhance body identity verification while ensuring a smooth integration with the existing information system. EBSL has come up with a total solution covering solution design, software including middleware, application and Application Programming Interface (API) integration with existing system, hardware, installation, fine-tuning, testing, support, documentation and maintenance. The new RFID based solution is implemented during key work processes of body receipt, photo taking, body identification, autopsy, release and cold chamber in-flow/out-flow process. The system devices including RFID printers, controller boxes with RFID readers, antennas, LED displays, alarms and door sensors installed in respective functional areas. With the new operation in place, a plastic wristband affixed with a RFID label, that including the barcode and deceased ID information, embedded with RFID tag will be tied on the body during body receipt. When the body is moved around the respective function rooms, the system would automatically detect, identify and display the matching deceased information. Alarms would be triggered in case of unauthorised bodies or improper procedures to alert the staff. Not only the new process can effectively keep track the location of bodies, but also closely monitors the operation with the log records sending to the system. Mortuary service is so important that no error could be tolerated. Using RFID means that the workflow does not totally depend on the staff. 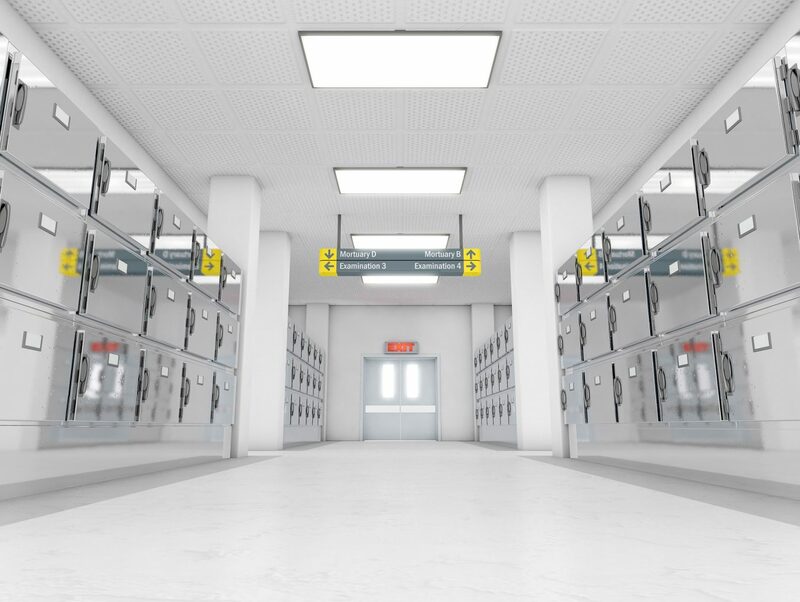 The RFID Mortuary Management Solution has strengthened the management of key body handling procedures by proactively providing validated case information to staff and next-of-kin in daily operation. It facilitates quick access to information of bodies so as to provide timely response and accuracy to body identification, autopsy and body release. The system is secure, scalable, flexible, reliable, efficient, cost effective and allows customization to meet the user requirements. Since the implementation, the case of body loss or mishandling is zero. The work pressure of the mortuary staff has been substantially reduced. The initially pilot scheme in one public mortuary has been expanded to other public mortuaries and public hospitals in Hong Kong. The project has been successfully developed and managed by EBSL whose role is to design, deliver, install and support the system.